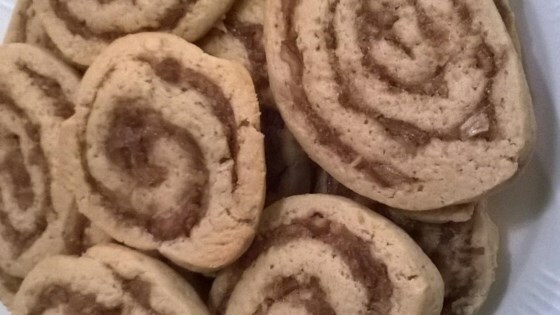 "Rolled cookies with a date-filled center." Chop pitted dates in food chopper. Place dates into small saucepan and add 1/4 cup sugar, dash of salt, and 1 1/4 cups of water. Cook, stirring constantly until mixture is of a soft consistency. Remove from heat. Add grated lemon rind, lemon juice, and chopped nuts. Mix well and chill. Cream together 3/4 cup butter and gradually add 1/2 cup white sugar and 1cup lightly packed brown sugar. Beat well. Beat 2 eggs until thick and add to creamed mixture part at a time, beating well after each addition. Stir in 1 1/2 teaspoons vanilla. Measure into a sifter 3 1/2 cups flour, 1 1/2 teaspoons baking powder, 1/4 teaspoon baking soda, and 3/4 teaspoon of salt. Sift together twice. Sift dry ingredients into creamed mixture about 1/4 at a time. Combine thoroughly after each addition. Chill until firm. With sharp knife, slice 1/4 inch thick slices off of rolls and place on greased cookie sheets. Bake 10 - 13 minutes. Let cool. Tasted good enough, but they were a little too much work. I made this with lemon zest substituted. The dough is a little sticky and hard to make a perfect pinwheel with but the taste was great! Very Good, recipe made a LOT! My daughter says they taste like fig newtons. These were great! Just the way my mom makes them, so I was happy! My only problem was that they were a little undercooked and soft - even after 15 minutes.